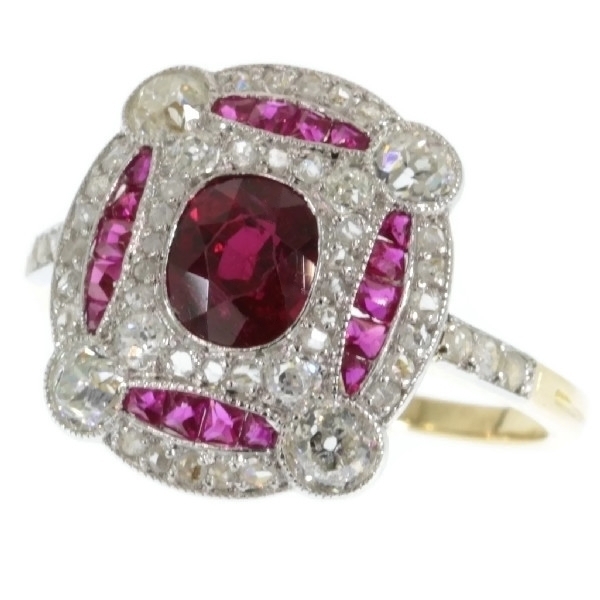 Superb platinum and gold Art deco ring with diamonds and rubies: Description by Adin Antique Jewelry. This stunning Art Deco ring in 18K yellow gold and platinum emanates romance through three ellipsis starting from its central natural oval cut ruby. Furthermore, the inner ellips of 18 carré cut rubies and an outer one with rose cut diamonds are crossed by a diamond-encrusted rectangle. The four old brilliant cut diamond corners could serve as your foundations of love. Diamonds: Four old brilliant cut diamonds with a total estimated weight of approx. 0.40 crt. four single brilliant cut diamonds (also called 8/8) with a total estimated weight of approx. 0.12 crt. and 44 rose cut diamonds . We do not have the weight of the diamonds which is normal in our trade when it comes to rose cuts. Precious stones: One natural ruby with an estimated weight of approximately 0.70 crt. and 18 carre cut ruby . We did not check if these 18 rubies are lab produced or not as this information has no influence on the value of this jewel. Natural rubies and lab produced rubies were both used in this era, rather more for their effect than for their intrinsic value.